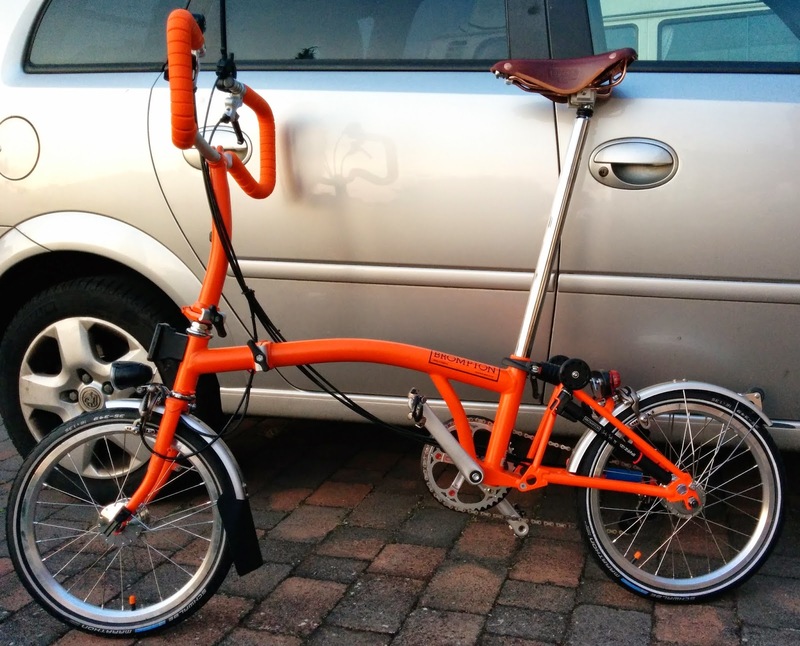 My Orange Brompton: My New Orange Brompton is Here!! 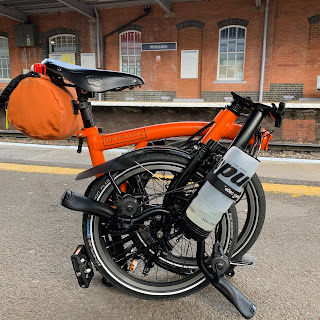 Today was a rather exciting day as the dealer I ordered my new Brompton from informed me that my bike was ready and would be sent out by Brompton this very afternoon. Being the best Brompton dealer bar none, I was able to collect it a day early! Hurrying home before having to go out to work again in the early evening, I wasted little time in taking the black foam grips off and replacing them with something altogether more orange. There are a few other subtle changes - I wonder if you can spot them? (Any eagle eyed types leave a comment). It is far too early to write anything at length other than I am VERY pleased with it. Below are some quick photos taken with my phone. Expect a great deal more! The P Type isn't for everyone, but I have admired them from afar for several years. For me at least it will give me all I need for the type of riding I am doing now and into the future. There is nothing like ordering a bespoke Brompton and there is something special when it finally arrives. Many thanks to the dealer I bought this Brompton from. He is a rather good chap and luckily for me a friend too. Cleats are on already, cant see any other changes quite yet. Congratulations! She's a beauty, and I see that she's already gotten her clips on, ready to roll! I love the orange handlebars! May you spend many happy miles together... We'll be watching the reports from the US! As i was looking at this to look for additions....the Brompton sticker is on the other side to mine. All the people I know the Brompton is on the drive side, or is it pot luck which side they stick it. Pot luck I suspect. My original was other way but my Raw Lacquer was the same as this. Congrats! Looks a lot my my Ol dirty, except for the awesome color. I hope you love it! 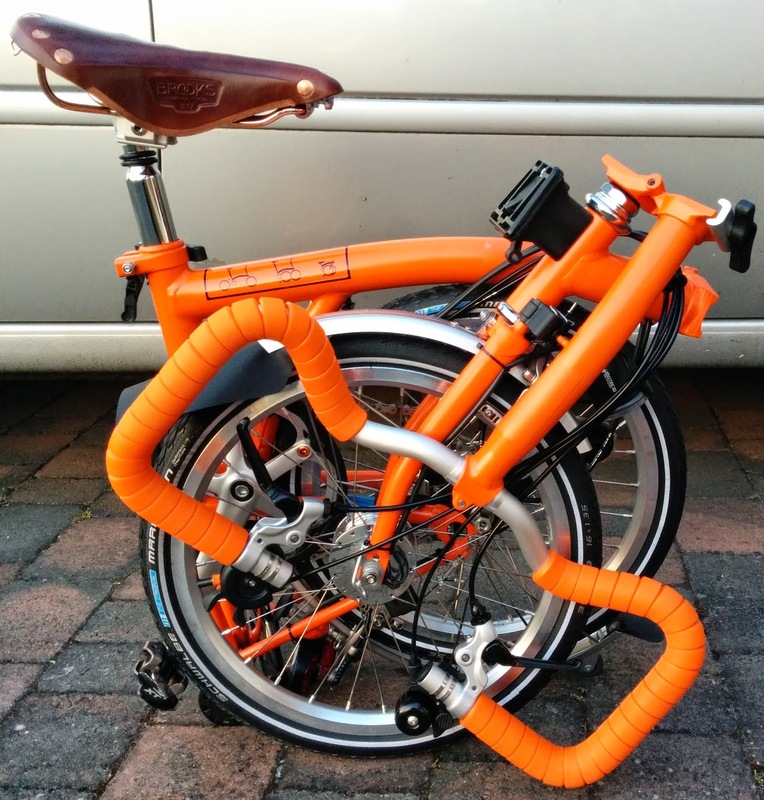 Do you still have the option of ordering either the BWR or BSR hub on your bespoke Brompton and which did you receive? The BWR hub is standard with the 6 speed. The other is standard with the 3 speed as far as I'm aware. Lovely color and great taste in the design. I've got a P6 with the SON dynamo too. You won't be disappointed with your spec for sure. In fact you're probably already delighted!! As well as the clips and valve caps as mentioned by others, I think I spot a custom chainring guard? !! Mr.O - I would be really interested to hear your thoughts about the P-type bars after a few months of extended use.